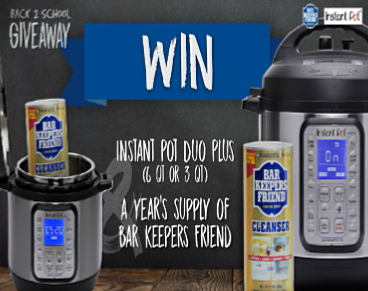 Bar Keepers Friend Instant Pot Sweepstakes – Win a Duo 6 qt. Instant Pot! Win a 9-in-1 Duo 6 qt Instant Pot & Bar Keepers Friend! ENTER SWEEPSTAKES HERE – Bar Keepers Friend Sweepstakes page. ENTRY LIMIT – One entry per person, via Facebook account, is allowed over the course of the giveaway (August 1 – 31, 2018). ELIGIBILITY – To enter this offer you must be 18 years or older and a resident of the United States or Canada. SWEEPSTAKES ENTRY PERIOD – The giveaway closes at 11:59 pm EDT on August 31, 2018. PRIZES – Two winners will be chosen. One winner will receive 1 (one) 9-in-1 Duo 6 qt Instant Pot and 12 (12) 12-ounce cans of Bar Keepers Friend Cleanser. One winner will receive 1 (one) 9-in-1 Duo Mini 3 qt Instant Pot and 12 (12) 12-ounce cans of Bar Keepers Friend Cleanser.